This was the first true wild week in College Football as we still have no idea what four teams will end up in the Playoffs. Below are my ten observations from the first week after the College Football Playoff rankings were released. Last week I joked that either UCF or Notre Dame can make the Playoff, but that is not a joke anymore. I have more Notre Dame down below, but UCF is another wild card. UCF is undefeated on the season and if two of the Power Five conference have two loss champions, then UCF is just one Notre Dame loss away from dreaming big. Clemson has been lost in the Playoff picture, despite the hiccup against Syracuse, the Tigers have bounced back. In my opinion they still do control their own destiny to the Playoffs but no one is really talking about them as a contender for the National Championship. I am sure that is how head coach Dabo Swinney prefers it, people overlooking Clemson even though they are the defending National Champions. Number 8- Is Georgia really the best team in the country? Georgia was surprisingly ranked #1 going into this week and took care of South Carolina without having a let down. I still do think that Georgia being ranked over Alabama was the committee’s way of grabbing some headlines but if the Bulldogs keep winning then they might just deserve to be ranked the best team in the country. Early this season, everyone had counted out Notre Dame after they lost at home to Georgia, little did we know that match up could happen again in the Playoffs. The Fighting Irish being a one loss team has thrown a wrench in to the committee’s brains and the Power Five conferences are losing sleep over the fact that Notre Dame will get in over two conference champions if they win the rest of their games. This week was a big loss for the whole conference of Big Ten. After the best team in the East has two losses all their hopes are in the Badgers’ basket. Wisconsin plays Michigan this week and if they are able to win that game and win the Big Ten title game then they deserve to be in the Playoff, otherwise the whole conference will be on the outside looking in on the Playoff. A couple of weeks ago, I said that USC is trash and they should just end their season, little did I know they were leading their division at the time. USC still can win their conference but will not go to the Playoffs, so the Trojans will most likely not be returning to the Rose Bowl this year. Number 4- Alabama has lost its fastball? Alabama had a chance to have a statement game this weekend and they did even cover the spread. LSU is basically mailing in the season, but they got up the season and kept the game relatively close, which hurts the Tide. Alabama does not have a statement win on the season and is also not ready to face Georgia in the SEC title game with they are playing right now. Will this year be the one where the reign of Alabama ends? Penn State lost a heart breaker last week, but somehow got a life line. Their game was supposed to end before the Ohio State game but due to a weather delay, they played the majority of the game knowing that Ohio State was going to lose and they could get back into the Playoff conversation. The Nittany Lions had a costly penalty in the tail end of the fourth quarter that awarded the game to Michigan State and ended all hopes of Penn State going to the Playoffs this year. The Bedlam game was the most exciting to watch this week. The over in that game was hit in the second quarter and the final score looked like a college basketball score. Oklahoma was able to prevail in an offensive shootout and got a marquee win they desperately needed. The Sooners play TCU this week and if they win this game then they are basically in the Playoffs as long as they win out, which should not be hard for them after this week. 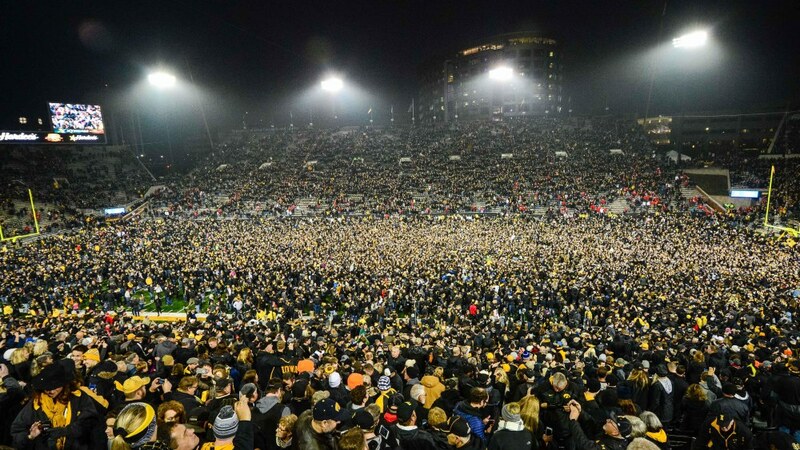 The most surprising game this week happened in Iowa City. A week after beating the #2 ranked team in the country, Ohio State was in the driver’s seat towards the Playoffs but laid another egg in the first half of the game. Last week they were able to recover to come back and win the game, but this Iowa never gave them a chance to come back. Ohio State can still win the Big Ten, but I highly doubt they will get in. As far as the state of Iowa, that is now three wins against teams that lead their conferences between Iowa and Iowa State. Oklahoma State plays in Ames against Iowa State this week and the Cyclones winning might just be my mortal lock of the Century.